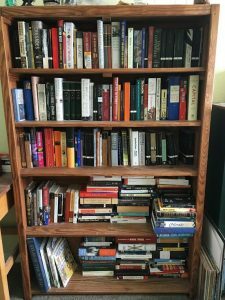 Each year, the Press and the Library & IT ask students to enter a contest to reflect on their lives, their learning, and their personal interests through their book collections. With bookstores closing and electronic media becoming more and more popular, we want to encourage the appreciation of a printed book, as well as recognize the importance of the Ellen Clarke Bertrand Library and the University Press, for every great university and institution of learning has, at its center, a great library and a great press. Pictured above: Tom Bonan’s bookshelf at home in Colorado. Contest runners-up are freshmen Sara Glass and Sasha Carpenter, with collections of religious texts and novels of triumph through suffering, respectively. With a mind to collecting from thrift shops and used collections, her texts contain plenty of history and unique pieces not found in your everyday bookstore.